Have you been wondering how to begin your adventure PlayerUnknown’s Battlegrounds and not die after two minutes? 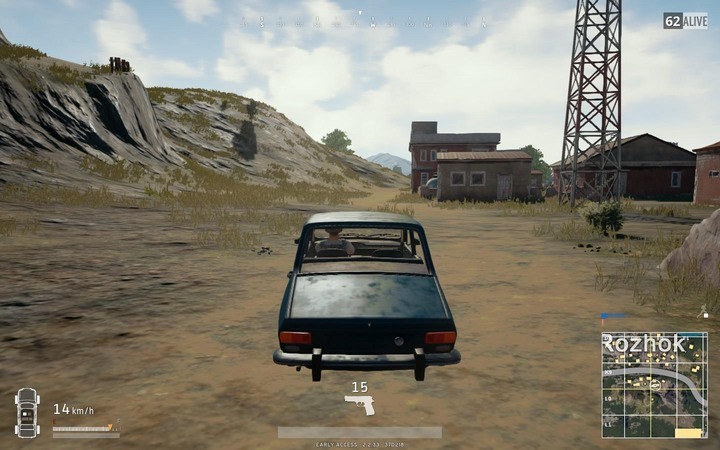 Our short but very concise guide to PlayerUnknown’s Battlegrounds will provide useful advice that will sure help you get your foot through the door of the unforgiving game world based on survival and Battle Royale rules. The aim is to eliminate all other players, consequently being the last survivor. This guide contains the controls scheme, a handful of advice about the gameplay, a list of all weapons and vehicles as well as some strategies and techniques that can help you survive and end up on top of the leaderboard. The beginning is always the hardest, so make sure to check our tactics that may help you answer how to survive in PlayerUnknown’s Battlegrounds. We’ve prepared a short but comprehensive article about how to survive in the fight where the stakes are your life. A good beginning is a job half done. 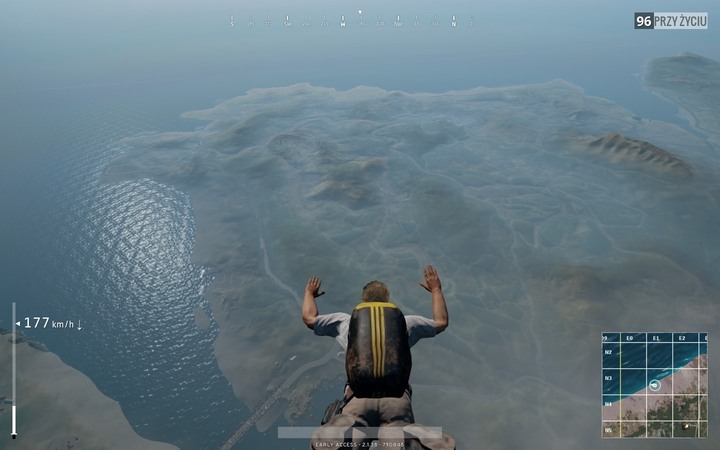 Each game begins aboard an airplane, from which you jump at any chosen moment by pressing F. Where should you go first? There’s no rule here: just make sure to land in the vicinity of some buildings, as they will provide some basic tools allowing you to face the other players. Without a simple crowbar and a basic gun, it will be virtually impossible to make it. I would say that it’s not a bad idea to leave the plane pretty late, near the northern edge of the map. Most players will disembark earlier – close to the denser habitats in the center of the map. If you jump off later, the initial stages of the game should go rather smoothly; during this time, as much as half players can be eliminated sometimes. In the meantime, you’ll have time to explore and loot whatever buildings you find to get some useful items. It’s also critical to reach the surface ASAP! No matter what – don’t open your parachute; it will open automatically. You also need to maximize the velocity – fly straight to your destination as fast as possible. Every second counts at the beginning, especially if there’s another player nearby. Of course making this decision spontaneously is only possible in solo game. 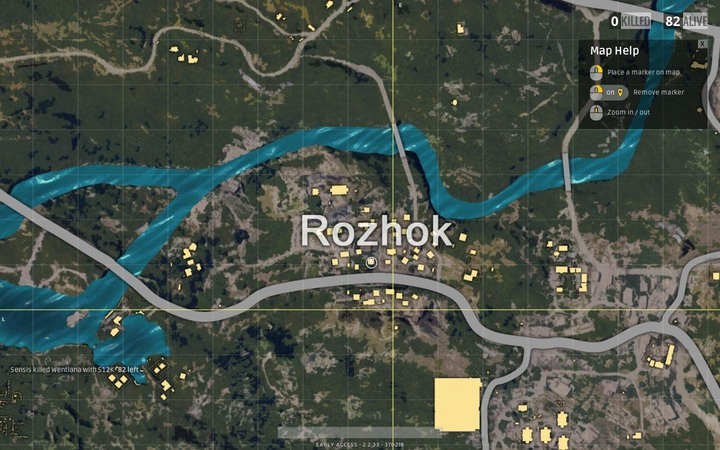 If you play in duo or in a team, you have to prearrange the drop zone. If you want to play in a team, a microphone is mandatory for a successful game. Use the comments below to submit your updates and corrections to this guide. Playerunknown’s Battlegrounds is an online shooter with survival elements, which focuses on the Battle Royale type of competition. 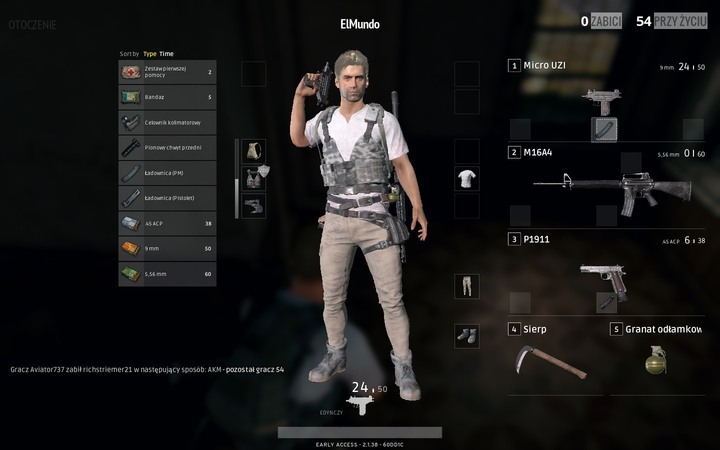 Designed for PC Playerunknown’s Battlegrounds is a first-person shooter, offering online Battle Royal type of gameplay, which is inspired by a Japanese novel of the same title, as well as by the well-known movie, Hunger Games. The rules are simple: a large number of players are closed together in a big location, each with only one mission – to eliminate everyone else. 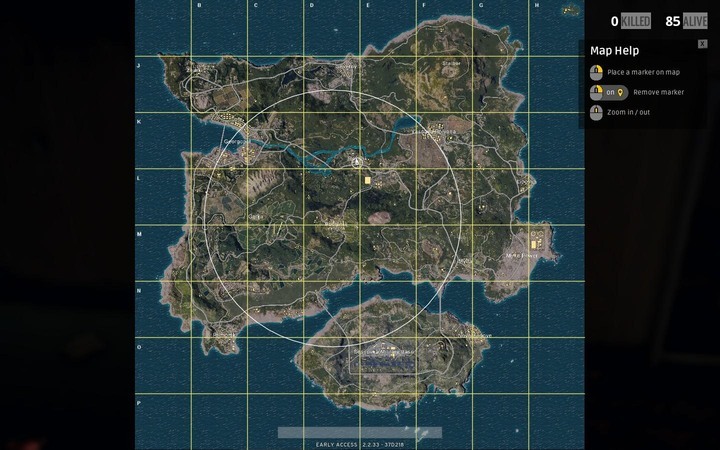 A game ends when there is only one player left alive. Participants start off completely unarmed, so the first phase is basically a race for the best weapons. Players can make use of various kinds of traps, and the game offers much freedom when it comes to choosing the methods of eliminating enemies. An extra help for that comes from a simple crafting system, which lets you construct items from gathered resources. Playerunknown’s Battlegrounds – Official Website. What PC do you need to play Playerunknown’s Battlegrounds at 60 FPS? 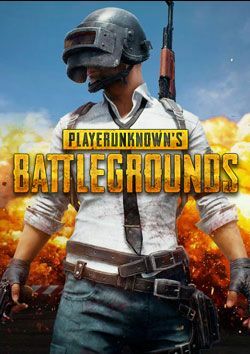 The official minimum PC system requirements for Playerunknown�s Battlegrounds may be enough to launch the game, but are far too low to play it at comfortable 60 FPS. Find out what PC you really need for the game. Despite its promise not to introduce any form of monetization in Playerunknown’s Battlegrounds before the game leaves Early Access, Bluehole has announced that micropayments are going to make it into the game next month. Find out why. Playerunknown’s Battlegrounds developer noticed some players frowning at the fact that the game offers both FPP and TPP at the same time. That’s why they’re introducing FPP-only servers. Bluehole continues to upgrade Playerunknown’s Battlegrounds. This week the popular competitive online shooter is getting two new weapons as well as performance and balance tweaks. Bluehole Studios shared some impressive facts regarding Playerunknown’s Battleground. In the three days since its Steam Early Access launch the game earned $11 million. 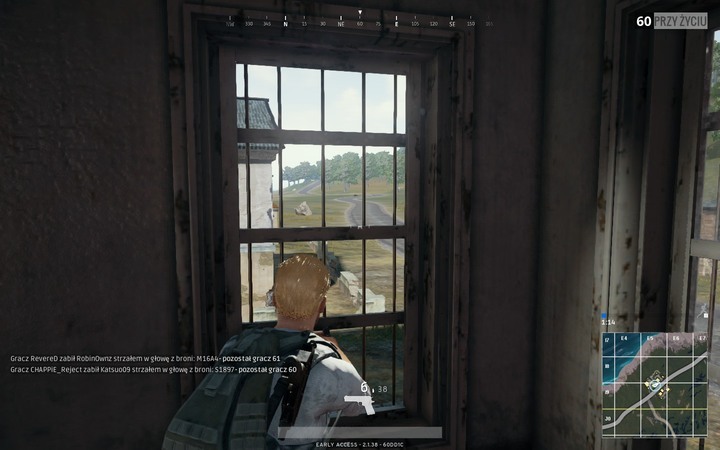 The rule to follow right after landfall is simple – get into the nearest building as soon as possible – regardless of presence of other players. The chances of eliminating an enemy in hand-to-hand combat are slim. Without the simples melee weapon no player actually attempts to tango with another. Depending on the circumstances you have a couple seconds to a minute to gather – even the most primitive – weapons. At the beginning, you should collect most of the encountered objects – especially ammo. During solo gameplay, your equipment can be quite substantial, so you don’t have to worry about carrying too much stuff. However sometimes it’s good to stay put during the first stage in some cozy room. You won’t gain much points for killing enemies, but it’s much more important to survive. Of course, I do not recommend staying in one spot the whole time, because the game is extremely boring then, and most of the time, you’ll get shot anyway. 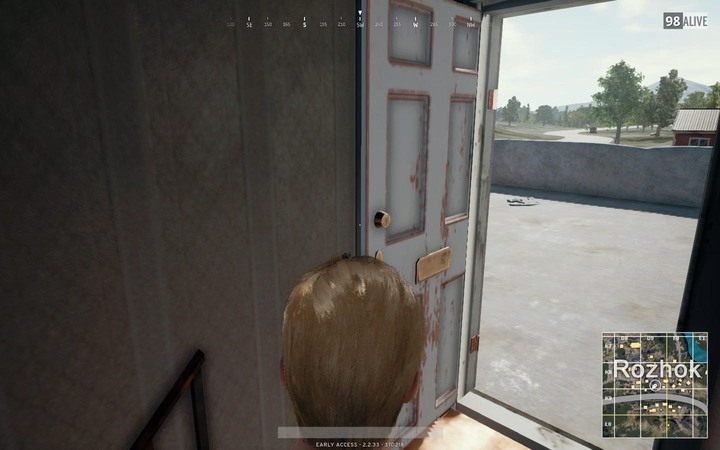 Still, waiting out until 20-30 players are eliminated may be a good idea, especially if you don’t manage to find a decent weapon. Vehicles are a great way of covering large distances – just don’t expect that you’ll be invincible because you’re driving a blue Moskvitch. It’s not especially hard to avoid getting hit by a car – on the other hand, destroying a vehicle or killing the driver is much easier than exchanging fire with an enemy that’s on foot. The cars also make a lot of noise, which might not be the most desired thing when everyone wants to kill you. You can open the inventory by pressing I or TAB. You will find there a list of items from your backpack, then a depiction of the avatar and the stuff it’s wearing. The last thing is the section with weapons that you’re wielding. You can simply drag’n’drop items from the inventory into the usable items fields – same goes for disposing of stuff you don’t need. Check out the slots underneath the firearms – there you can put different augmentations that will improve your aiming, accuracy or increase the ammo capacity of the gun. It’s a sort of very rudimentary crafting mechanic. Weapon mods can be found in different parts of the map – collect them, because in case of long-range weapons more accuracy or more ammo capacity can mean the difference between life and death. Selecting the right weapon is your key to success. Although, you will need to gain certain skills, picking a good weapon is still crucial. There are 20 weapons to choose from. AWM is definitely the best choice when it comes to long range combat – it has the best range and fire power. Due to its extended ammo clip, SKS is your best option for mid-range and close combat. AKM can deal the largest damage but all of the presented rifles will do well in mid-range combat. M16A4 is an interesting option due to its rate of fire. M249 or Tommy Gun are the only useful guns due to their range of fire and ammo capacity. Use UMP9 and UZI only if necessary – try to switch them to something better as soon as possible. 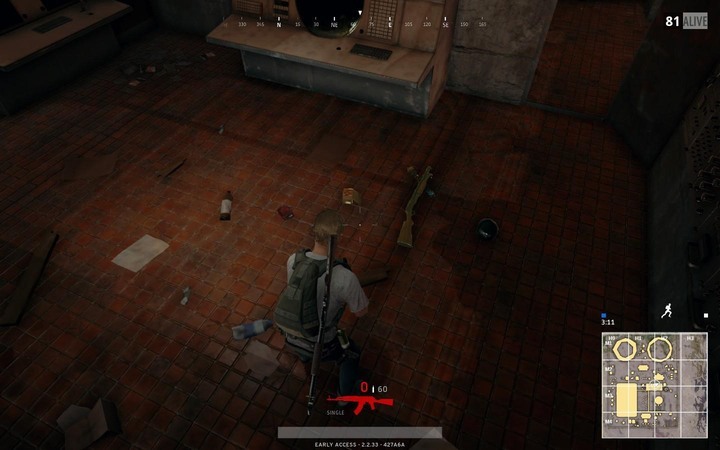 There is no point in going any further with their description – shotguns are useless in PlayerUnknown Battlegrounds. The Maps are so large that shotguns may be used only at the very beginning. 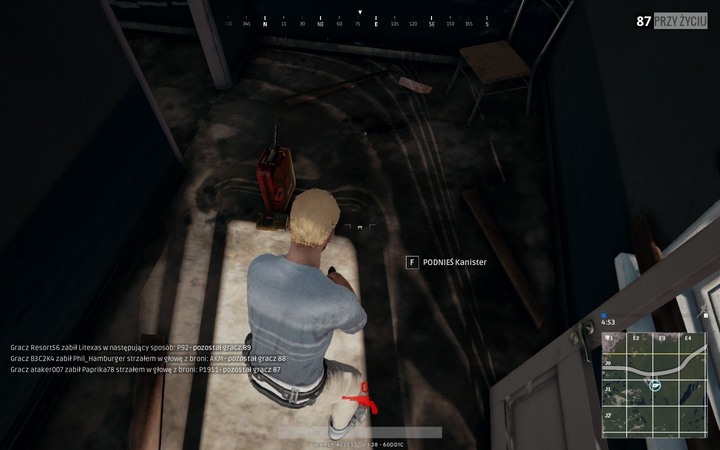 It’s the same situation as in the case of shotguns – they only come in handy in close combat, and there won’t be much of it in PlayerUnknown Battlegrounds. Even if you come across one, just look for something better. Use vehicles to quickly move from one place to another. Just keep in mind that using cars or buggy vehicles to eliminate your opponents is a poor decision. Avoiding incoming vehicles is very easy and can lure enemies to your position, due to the fact that vehicles are extremely loud. Furthermore, executing a player behind the wheel is definitely easier than killing one, who is firing at a vehicle. Where can we find the majority of vehicles? Search near Novorepnoye and Rozhok. However, a better option would be to search in the north, where players don’t venture that often. 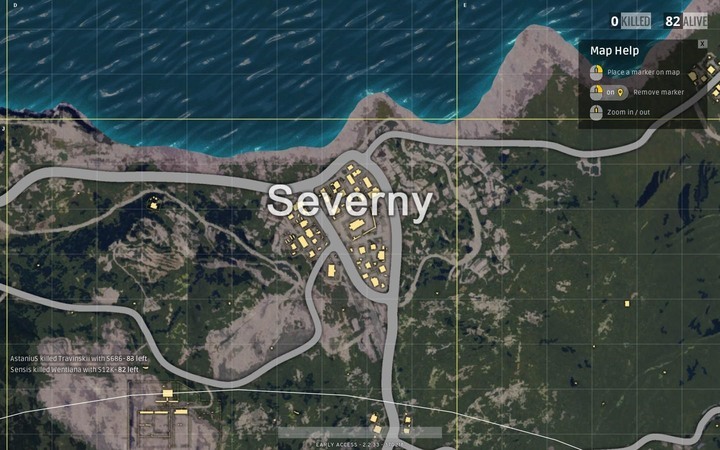 Check out the area surrounding Severny and Zharki. In PlayerUnknown’s Battlegrounds there is just one death, thus you need to be extra cautious on the battlefield. Although, it is not possible to predict everything, there are many ways to reduce the threat. Reload your weapons when you’re in a safe position or in a building. Often, these several seconds that you need to spend to perform the activity would be enough for your enemy to eliminate you. Although, you won’t be able to do so in close combat, make sure that your ammo is full before setting up for a longer journey. One should carry items that can restore your health (fully or at least some of it). Regardless, whether that’s some bandages or a first aid kit, you can only die once. Thus, don’t wait for the very last moment to restore your health. Just pay attention where you heal yourself – try not to do it in an open field. Although it may seem irrational, one should remember to close doors behind himself/herself – it doesn’t matter if you are entering a building or exploring a room. Not only will this make it harder for other players to get to you, but it also will alert you about their presence. Furthermore, closed doors can suggest that no one is inside, and that can let you wait safely until your threat goes away. We have already mentioned some problems concerning vehicles. Cars will lure enemies towards you – they are well-visible and extremely loud. Don’t get into a fight when driving a car – it’s a suicide. Use vehicles only when you need to move quickly from one place to another. If you want to survive, avoid red zones at all cost – they represent the bombardment areas. It’s quite obvious why going there is not the best idea. If you use the scattered towers properly, you can be sure that all the nearby players will fall dead to their knees. All you need is the right sniper rifle and patience. One should use all the tall objects, especially these located in an open field. It’s more effective to shoot tires of a vehicle, rather than fire at the driver – such vehicles become useless and our enemy has no way of escaping. 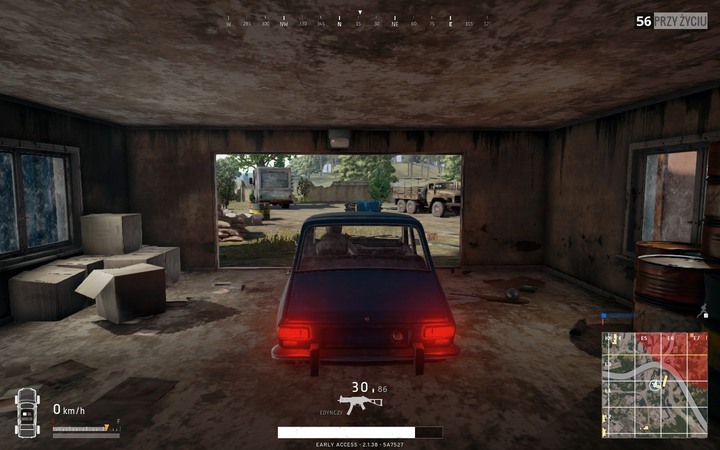 Before the player even has a chance to get out of the car, he will be dead and gone. Although it may seem irrational, disabling certain graphical effects can give you a major advantage over your enemy. Reduce grass visibility and all the opponents who would try to hide in it will be fully visible to you. Being able to determine noise direction in this game is crucial – if you can hear your opponent, you can locate and eliminate him. Paying attention to the direction of fire or incoming vehicles is very useful to ambush your enemies. A city located in the west part of the map. One of the largest ones, and thus a popular starting location for many players who wish to get their hands on best weapons (especially sniper rifles) right away. Furthermore, there are some vehicles scattered across fields surrounding the city. 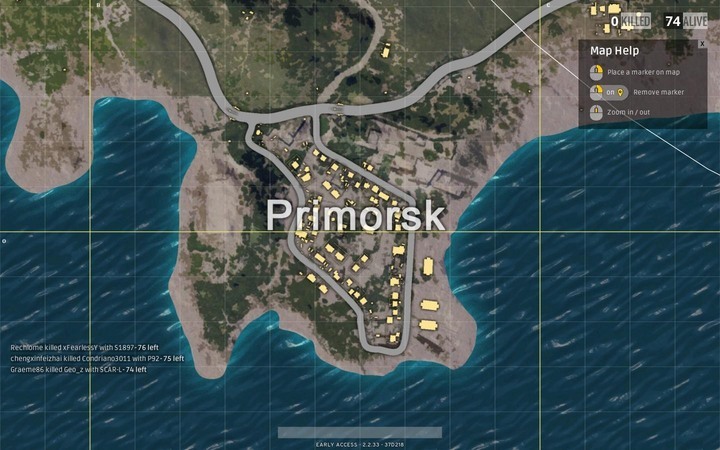 Zharki city is located not far from Georgopol – there, you can come across basic equipment. 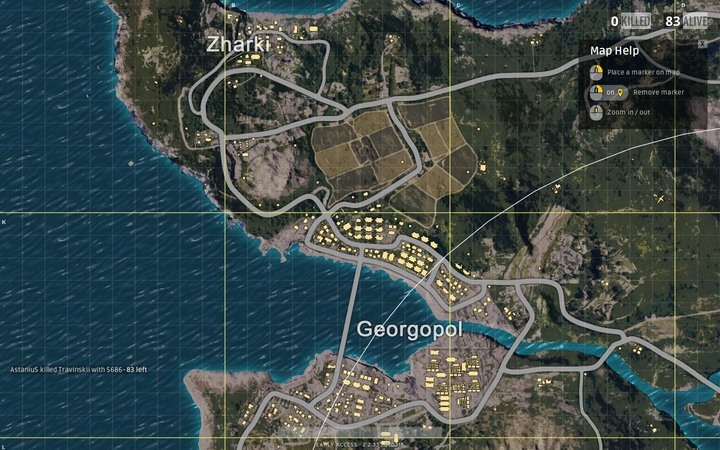 It may actually be a good idea to wait till the early massacre in Georgopol is over and visit that city thanks to many vehicles located in that area. A city where the school building is the main destination – there you will find many interesting weapons (especially sniper rifles), and the majority of players as well. 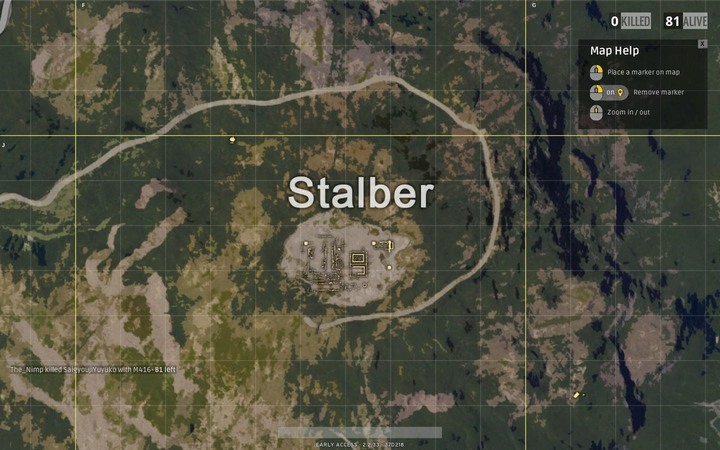 It’s a good starting location, due to scattered vehicles, and a very popular one as well. 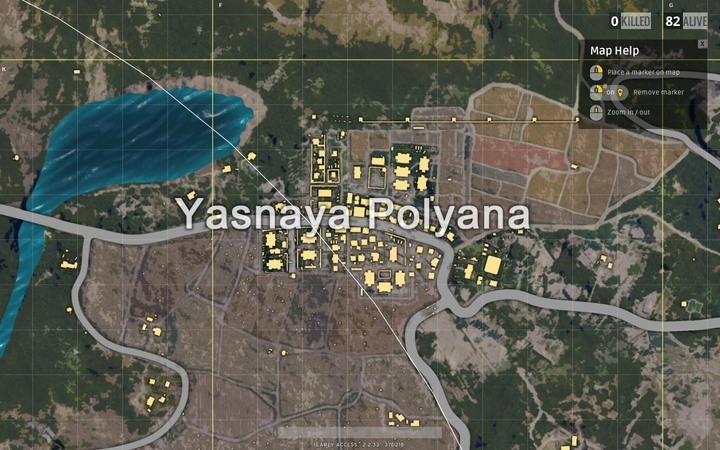 Yasnaya Polyana is right next to Rozhoka – this small town is characterized by large acreage, and due to many available vehicles, it is often considered a good starting location. 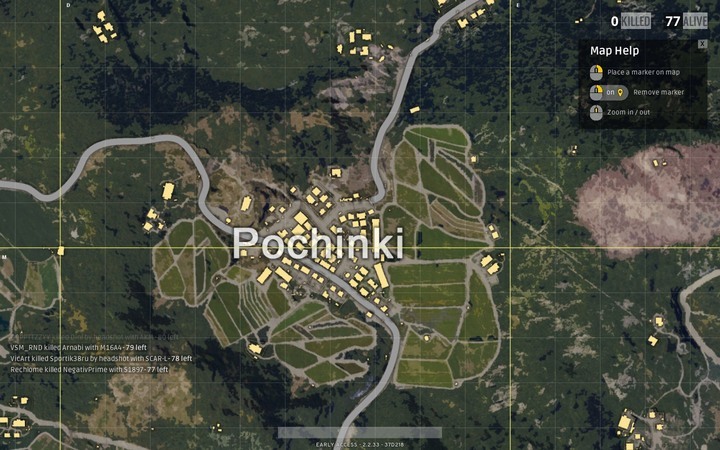 Pochinki is a small town located south of Rozhoka and Yasnaya Polyana. Although, it’s often avoided by players, it offers many powerful weapons. It’s a great starting location, especially when you can find some vehicles near the buildings. This isolated location is far away from all other settlements – it’s in the north-west part of the area and can be a very good destination for everyone who wants to survive the first stage of fights. Unfortunately, due to lack of vehicles, it may take some time before you leave the wilds. The town offers only basic equipment, such as pistols. This place is located in a secluded area by the coast, and it’s definitely worth your time – here, you will come across many items and weapons. Furthermore, it’s a location where vehicles respawn. The main drawback is the fact that this town is far away from all the other cities. However, using one of the vehicles to get to one of them faster is much easier. One should keep in mind that many pieces of upgraded equipment can be found around this location. 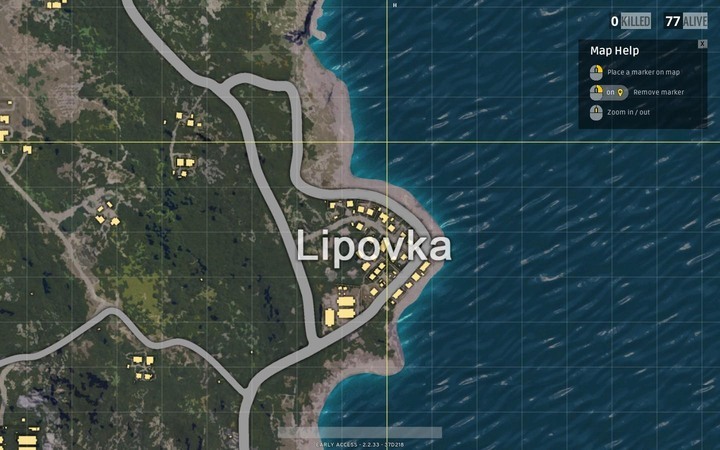 In contrast to Primorsk, Lipovka is located on the other side of the map but both towns have similar features – they are rather small, not that popular among players, and full of valuable weapons and equipment. It’s a fine place to use and raid other, larger cities that are overcrowded at the early stage of the game. 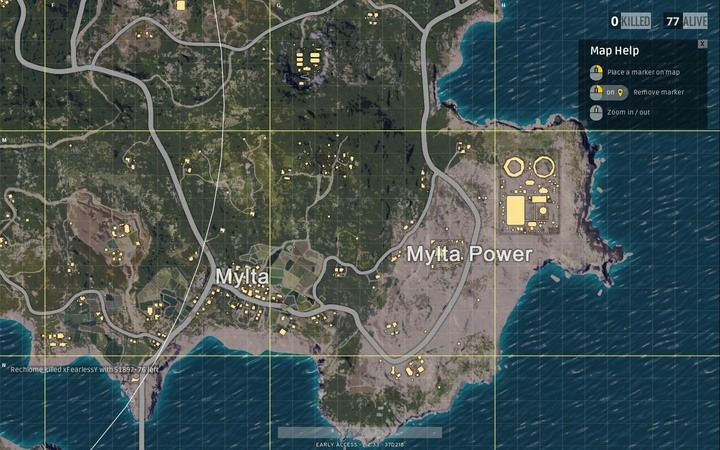 Mylta does not have much to offer. However, you can find vehicles around this town, and thus investigating the nearby power plant may be a good idea. Players who prefer high quality equipment will love this place – you can come across best sniper rifles, machine guns, helmets and pieces of equipment. Unfortunately, the fact that there are barely any building makes this place a good sniper town (best to hide in the power plant and wait for your prey). It’s extremely difficult to get to this place. Located on an island, and offering various military buildings. Explore this place and you will find out that many valuable guns and items can be found here. Unfortunately, you will not come across any vehicles. 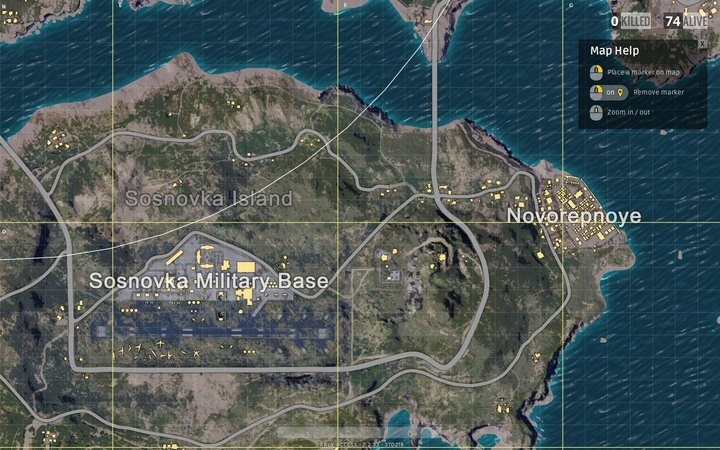 If you need some, head towards Novorepnoye, located by the coast – you will need a car to get back to the proper part of the map quickly. Apart from the military equipment, being able to use one of the vehicles is enough to investigate this location (that is, if you begin your gameplay here). 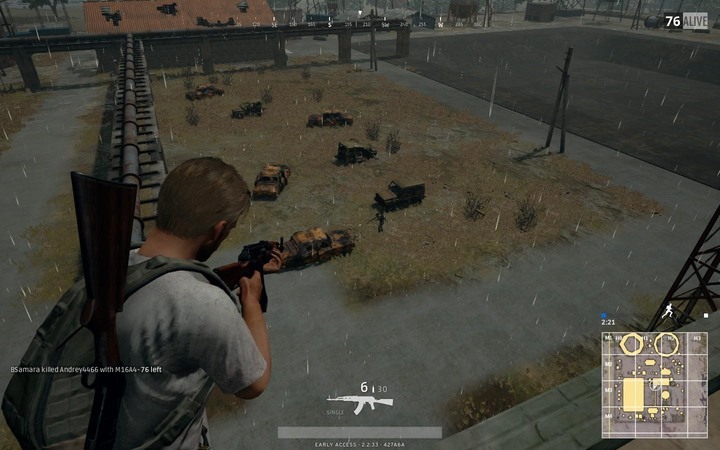 It’s best to avoid both these locations – there is barely anything here, you won’t come across any useful weapons or vehicles. Furthermore, these are large, empty areas, which makes it just too easy to get assassinated by a sharpshooter. Good luck if you decide to start your gameplay here.